This is the third enlarged version of the book, which was first published in 1977. It surveys the major developments in India’s social, economic and cultural history up to the end of the ancient period and explains the rise and fall of empires with reference to their material bases. It pays special attention to elements of changes and continuity and gives the lie to the view that Indian society has been stagnant and changeless, a view propagated by Western scholars in the heyday of British imperialism and which continues to be peddled ingeniously in our own times. It analyses the changing forms of exploitation and social tensions and the role of religion and superstition in curbing them. It also stresses the fact that the achievements of ancient India, remarkable though they were, cannot cover up the social and economic disparities which we have inherited from the past. The assassination of Mahatma Gandhi and the demolition of the Baburi Masjid are two… unforgettable milestones in the unfolding of the backward looking Hindu revivalist and fascist politics of contemporary India. Some Indian historians tirelessly speak of their (the Guptas) rule as a golden age… The truly golden age of the people does not lie in the past, but in the future. Dwijendra Narayan Jha (popularly known as D.N.Jha) graduated from the Presidency College in 1957 and obtained M.A. and Ph.D. degree from Patna University, where he also taught history up to 1975. He was professor of history at the University of Delhi until his retirement in 2005. His works include Revenue System in Post- Maurya and Gupta Times (Calcutta, 1967), Ancient India: An Introductory Outline (Delhi, 1977), Economy and Society in Early India: Issues and Paradigms (Delhi, 1993), The Myth of the Holy Cow (London, 2002), Early india (Delhi,2004) and Rethinking Hindu Identity (London, 2009). He recent edited works are The Feudal Order (Delhi, 2009; jointly with Eugenia Vanina), The Many Careers of D.D. Kosambi: Critical Essays (Delhi, 2011), Contesting Symbols and Stereotypes: Essays on Indian History and Culture (Delhi, 2013), The Complex Heritages of Early India (Delhi, 2014) and The Evolution of a Nation: Pre- colonial to Post- Colonial (Delhi, 2014). Professor D.N. Jha was General President of the Indian History Congress in 2005-06. The present book is primarily meant for general readers who have some interest in India's early history. It surveys the main historical developments in ancient India up to the end of the Gupta rule in the- 6th century AD and takes into account the recent studies by specialists on the subject. The draft of the book was read by Professor R.S. Sharma, head of the department of history, University of Delhi, whose suggestions and incisive comments have helped me a great deal. I am grateful to Professor A.L. Basham,Australian National University, Canberra, who has made me think afresh on many points. My thanks are due to Shri S. Sengupta for drawing maps, Shri Kameshwar Prasad, lecturer in history, Patna University, for preparing the index, and to the Archaeological Survey of India for the illustrations. I am also thankful to my friends Professor R.L. Shukla, Shri Mohit Sen, Shri M.B. Rao and Shri Subodh Roy for their keen interest in the completion of the work. I do not know how to adequately express my thanks to my wife Rajrani for assisting me silently in various ways. The present book is a substantially modified and enlarged version of my Ancient India: An Introductory Outline, first published in 1977. It has since had nine reprints in English and eight in Hindi as well as a Chinese edition(1984).The survival of the book for more than two decades has forced me to both review and revise it. 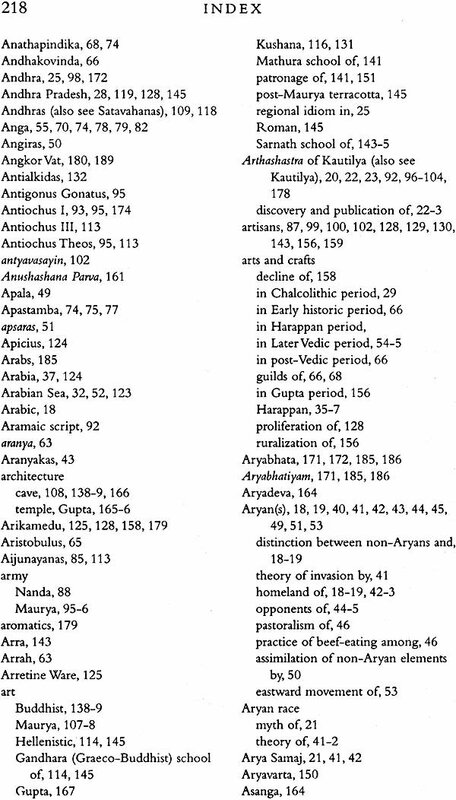 All the chapters of the book have, therefore, been rewritten and most of the points made earlier have been elaborated on the basis of recent researches which have brought about some change in my perception of the historical processes at work in ancient India without, necessarily, making me take an academic somersault. The bibliography has been updated and made more detailed to enable the non-specialist reader to investigate points which may appear to him worth pursuing. Revision has thus meant rewriting which has made the book quite different from its earlier version. This should explain why it is being issued under a modified title. I have always benefited from interaction with my students and professional colleagues but for whose criticisms the book could not have taken its present shape. In the course of its preparation I have received help from a number of friends and well wishers some of whom insist on anonymity. I cannot, however, restrain myself from expressing my gratitude to Professor R.S. Sharma who has extended unhesitating support to my academic endeavours during the last four decades. Professor Shingo Einoo of the Institute of Oriental Culture, University of Tokyo, found time to. discuss with me the various "aspects of brahmanical rituals and their social context. Professor K.M. Shrimali, Dr Nayanjot Lahiri, Dr: B.P. Sahu, Dr R.K. Chattopadhyaya and Dr V.M. Jha drew my attention to some recent publications; and Dr MonicaJuneja helped me by interpreting some writings in German. Mrs Suchitra Gupta and Mr DN. Gupta used their influence to get some rare books for my use. Mr Bhola Nath Varma of Manohar Publishers & Distributors gave me valuable editorial advice. Mr J.B. Khanna of the Delhi University Library System and Mr Parmanand Sahay of the Indian Council of Historical Research, New Delhi, ungrudgingly allowed me to consult the books which are difficult to get in Delhi. Ratan Lal, Ashutosh and Jagriti have rendered bibliographical assistance. Mr Shyam Narain Lal has supplied the maps and Mr Ramesh Jain of the Manohar Publishers & Distributors has expedited the publication of the book. Gopal andAmarnath have helped in various ways. Dr CM. Jha and- Dr (Mrs) R.K. Jha have always stood by-me in difficult times. I am grateful to all of them. In revising the last chapter of the book I have made use of the data collected by me for a research project sponsored and funded by the Indian Council of Social Science Research, New Delhi. I take this opportunity to thank them. I place on record my gratitude to my late mother-in-law Saraswatee Sinha who constantly goaded me to complete the work but did not live to see it in print. I wish I could find right words to express my indebtedness to my wife Rajrani whose robust optimism has been a constant source of inspiration. This book is dedicated to the memory of the late lamented Damodar Dharmanand Kosambi who granted me the privilege of working under his guidance during his field trips 'to the villages of Bihar in the last years of his life. It is a pity that the compilation of his papers on Indology done by me nearly two decades ago for publication by the Indian Council of Historical Research, New Delhi, has become the victim of the pettifoggery of some 'friends'. This book was last revised when its second edition came out in 1998. Since then, literature has appeared which made another revision necessary, One way would have been to rewrite the book and incorporate whatever new data has come to light. But that would result only in adding a few details in different chapters without altering, in any significant way, my perception of India's past. I have instead taken note of the feedback which I have received from my readers, especially students, who need to have a balanced view of the place India enjoyed in the ancient world as well as its legacy in different spheres of life. This, I think, is especially necessary at a time when wild and fanciful claims are being made about India's ancient achievements in some quarters. Rather than rewrite the book I have added an Epilogue which focuses on the contact of ancient India with the outside world and on those developments which influence our life and thought in modern times. A small select bibliography for it has been appended at the end of the existing one. Mr Mukul Dube edited the draft of the Epilogue,Dr Vishwa Mohan Jha made incisive comments on it and Mr Siddharth Chowdhury has seen it through the press. Dr Jyotsna Arora, Ms Malavika Gulati and Ms Noor Aziz extended indispensable bibliographical assistance and Mr Ramesh jain has facilitated the book's publication. I thank all of them. I do not know how to thank my wife Rajrani for being always there. For long centuries India was known to the rest of the world only through stray references to it in classical Greek and Roman literature. In the eighteenth century, however, we come across a few Jesuit fathers in the peninsular region making a systematic effort to understand the life of the Indian people. Father Hanxleden, active in the Malabar area from the end of the seventeenth century to the fourth decade of the eighteenth, wrote the first Sanskrit grammar in a European language, which remained unpublished. Father Couerdoux, in 1767, was the first to recognize the affinity between Sanskrit and European languages. The foundation of Indology, however, was laid not by Jesuit missionaries but by officers of the English East India Company. A trading organization at the time of its inception in 1600, it gradually acquired territories which were later to become the building blocks of the British empire. The transformation of a trading partner into a ruling power, though an area of absorbing study, is not our concern here. But it is necessary to bear in mind that historical writing-in the modern sense-on early India began as a sequel to the establishment of the English East India Company. The growing administrative responsibilities of the Company, especially after 1765 when the Mughals granted it the right to collect revenues and administer civil justice in Bengal, made it necessary for its officer to gain familiarity with the laws, habits, customs, and history of the Indian people. Many administrators therefore evinced keen interest in Indian literature and culture. In 1776 N.B. Halhed translated into English the most authoritative among all the early Indian legal texts, the lawbook of Manu, which appeared in German two years later. In 1785, Charles Wilkins rendered into English the Bhagavadgita, the most popular religious text of the upper caste Hindus, to be followed in1787, by his translation of the Hitopadesha, a popular collection of fables composed by Narayana in the twelfth century in Bengal. H.T. Colebrooke, who had around this time become associated with the collection of revenue in Tirhut and was able to master Sanskrit, wrote 'extensively on the Indian concept of time, religious rites and customs and various other aspects of Indian culture on the basis of intensive study of the original texts. The most important of the Company's officers who gave a real boost to Indian studies was Sir William Jones. He came to Calcutta as a judge of the Supreme Court of Bengal in 1783 and founded the Asiatic Society of Bengal in the following year. The Society and its journal, Asiatic Researches. provided a much needed forum for Oriental studies' and can be regarded as a landmark in the revelation of the traditional thought and culture of India, A polyglot with knowledge of Hebrew, Arabic, Persian, Turkish and Sanskrit and a smattering of Chinese, Jones translated the Shankuntala of Kalidasa (which drew unqualified admiration from Herder and Goethe and reached an extremely wide European readership), the Gitagovinda, and legal texts like the Al Sirajiyyah, and the Manavadharmashastra. Intensive research on the Muslim and Hindu laws of inheritance undertaken by Jones and his British contemporaries may be seen as an attempt to break the Indian monopoly of legal knowledge and assert British judicial power. The efforts of Sir William Jones were followed by "the establishment of the Bombay Asiatic Society in 1804 and of the Asiatic Society of Great Britain in 1823. All this gave a stimulus to the study of ancient Indian history and culture, and Indological studies no longer remained the preoccupation. of Company officers in India. Interest in Indian culture was aroused at a number of European universities where several scholars worked on Sanskrit and related subjects. The best known of the early Orientalists and lndologists was' Max Mueller who never visited India and spent most of his time in England. The affinity between Sanskrit and certain European languages, once discovered, was stressed. This may partially explain the growing interest in Indology outside England. It also gave rise to the idea of a common Indo-European homeland and heritage. The Aryans in India came to be regarded as the brethren of the Europeans. Some upper class Indians like Keshub Chandra Sen took this literally and identified themselves with the British people. A distinction was drawn between Aryans and non-Aryans, and a variety of virtues were attributed to the former. This in turn gave rise to the Aryan/Dravidian dichotomy amply reflected in historical writings on early India. Several early Orientalists like Max Mueller spoke glowingly about the unchanging Indian village communities. They thought of India as a country of philosophers given to metaphysical speculation with little concern for their mundane existence. Indian society was depicted as idyllic, and as being devoid of any tension or social discord. Possibly ill at ease with the changes caused by rapid industrialization in the West, they found a utopia in India and sought their own identity in it. 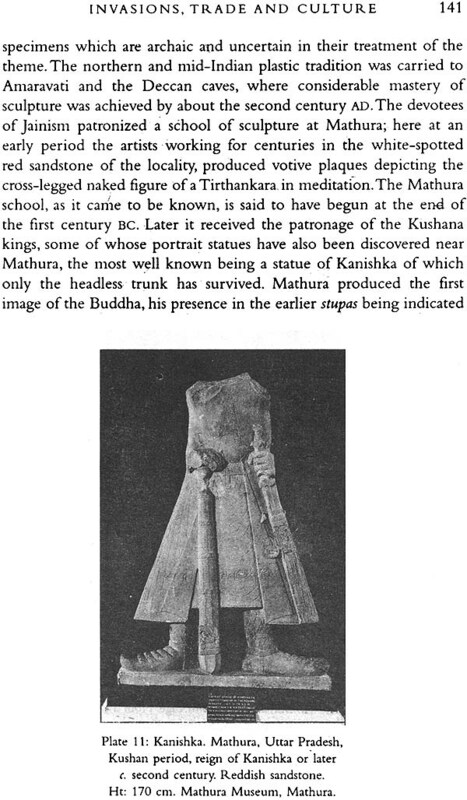 Max Mueller thus took the Sanskritic name Moksha Mula. Some of his ideas were misconstrued by the British to emphasize (sometimes quite crudely) that Indians were not fit to govern themselves, given as they were primarily to metaphysical thought. By and large his perception of India, recently described as part of some kind of , Indo mania' , was not acceptable in nineteenth-century England where the intellectual scene was dominated by Christian missionaries led by Charles Grant and the Utilitarians, especially James Mill. Grant and Mill did not share the early Orientalist view of India, and their writings give ample evidence of hostility to Indian culture. They are therefore said to have created an 'Indophobia'. The Christian missionaries had little sympathy for Hinduism, which, in their view, was 'at best the work of human folly and at worst the outcome of a diabolic inspiration'. The people of India, according to Charles Grant, lived in a 'degenerate' condition because of Hinduism, the source of dishonesty, perjury, selfishness, social divisions, debasement of women and sexual vice. Though not a missionary himself, Grant was an important personage in missionary circles, and exercised a lasting and strong influence on nineteenth-century British thought on India. His Anglicist bias made him plead strongly for the conversion of Indians to Christianity. It seems to have received memorable expression in the famous Minute on Indian Education (1835) authored by Thomas Babington Macaulay who had a high profile Evangelical family background. The Utilitarians seem' to have had much in common with the hostile missionary attitude to India as is clear from James Mill's three- volume History of British India, first published in 1817. It became popular enough to go into its fifth edition by 1858, though H.H. Wilson, the first Professor of Sanskrit at Oxford, was contemptuous of Mill's perception of Indian culture and went to the extent of saying that 'its tendency was evil'. Mill divided Indian history into three periods, the Hindu, Muslim and British. The seeds of communal historiography were thus sown. Unduly critical of the people and their culture, Mill postulated that contemporary as well as ancient India was barbarous and antirational. Indian civilization, according to him, showed no concern for political values and India had been ruled by a series of despots. Stagnant since its inception, Indian society was inimical to progress. All this was based on a grossly distorted version of the early Orientalist writings on India. In his book Mill was obviously making a case for changing Indian society through British legislation. This he was doing without ever having visited the country or knowing any of its languages-a fact he tried hard. to justify by making the facile claim to writing a 'judging history'. Mill's History was one of the prescribed texts at the institutions like Haileybury College where English officers received their training before coming to India. Hence the historical writings on India by British administrators betray the influence of Mill in considerable measure. 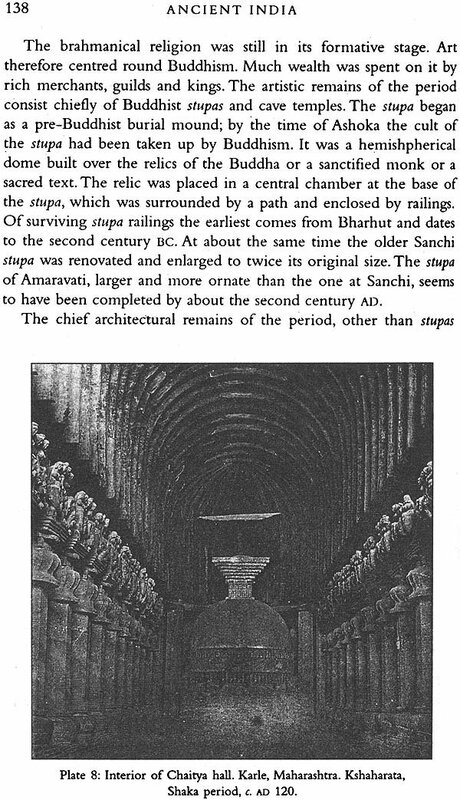 The best known of the British-administrator historians on ancient India was Vincent A. Smith. He came to India in 1869 as a member of the Indian Civil Service and remained in service until 1900. He wrote all his nine books on Indian history after retirement. Of these his Early History if India, published in 1904, was based on a deep study of the primary sources available at the time. It was the first systematic survey of early Indian history and remained perhaps the most influential textbook for nearly fifty years and is sometimes used by scholars and students even today. Less hostile to India than Mill, Smith nevertheless believed that it had a long tradition of oppressive despots-a tradition which ended only with the advent of the British. The implication was that Indians were not fit to rule themselves. In keeping with the main trends of contemporary British historiography, Smith gave much attention to great men in history; and Alexander, Ashoka, Chandragupta II and Akbar became his heroes. Smith exaggerated the ruthlessness of ancient Indian kings. The theory of governance in the Arthashastra was to him like that of imperial Germany with which Britain was later at war. He described Kautilya's penal code as 'ferociously severe', conveniently ignoring the fact that other ancient law codes were no less so. 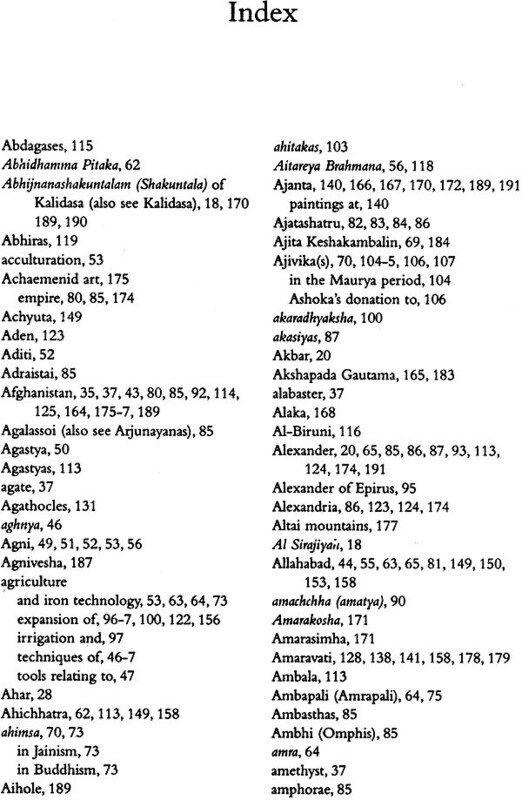 The corpus of literature generated by the British scholars on early . India was not univocal and it is possible to identify differences in the perceptions of individual authors. Nevertheless it remains true that the British wrote on early Indian history with a view to providing historical justification for the Raj and its exploitation of Indian resources. This quite often led to gross distortion of historical evidence. Such portrayals are viewed as part of the Orientalist discourse in which Orientalism is interpreted 'as a Western style for dominating, restructuring, and for having authority over the Orient'. All this, however, does not negate the value and importance of the imperialist historiography. British views of the early Indian history came to be strongly challenged by Indian scholars influenced by Indian reformist leaders, and also by the growing nationalism and political awakening. Rama- krishna Pararnahansa asserted that Hinduism embraced all religions in its fold. His disciple Vivekananda and later Annie Besant, sought to prove the superiority of the Hindu religion. Bankim Chandra preached that a revival of Hinduism was essential for the growth of India as a nation. Dayanand Saraswati, the founder of the Arya Samaj, gave the call 'Back to the Vedas'. 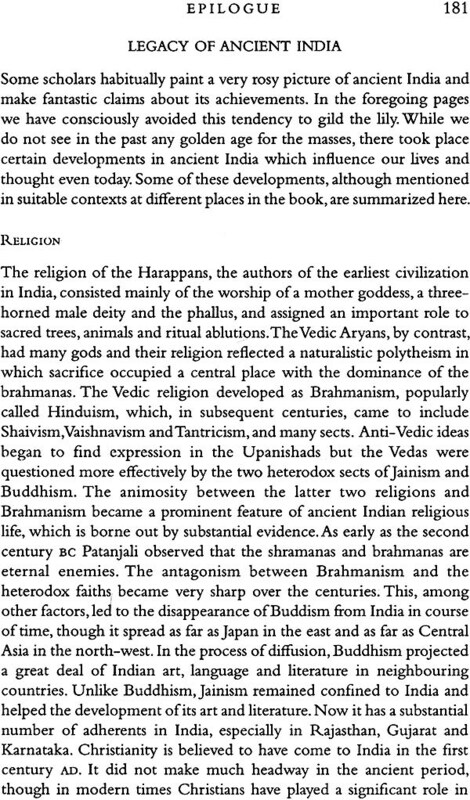 Under the impact of such teachings, Indian scholars strongly defended Hinduism and it was often held that the Vedas represent its purest form-thus completely ignoring the fact that Hinduism was at best an umbrella term for the Various strands of Indian religious thought, beliefs and practices prevalent in the Indian subcontinent. The Vedas were regarded as the repository of all : knowledge and rational thought, and even as anticipating some modern scientific discoveries. Inevitably the myth of the Aryan race stirred the imagination of nationalist leaders as well as historians. 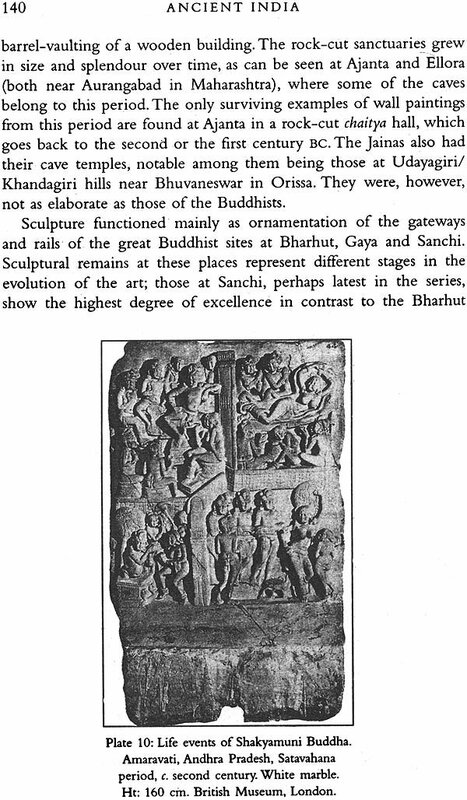 Already the early Orientalists had established that Sanskrit and certain European languages had connected histories. 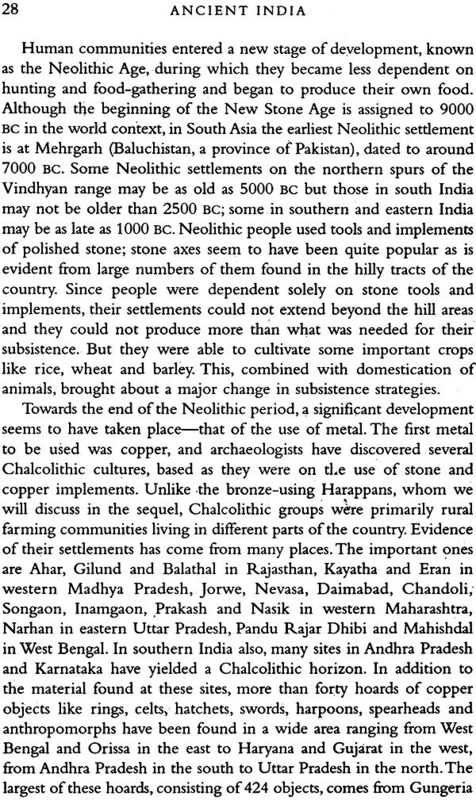 Indian scholars now regarded the Indo-Aryans as originators of human civilization with India as its cradle. 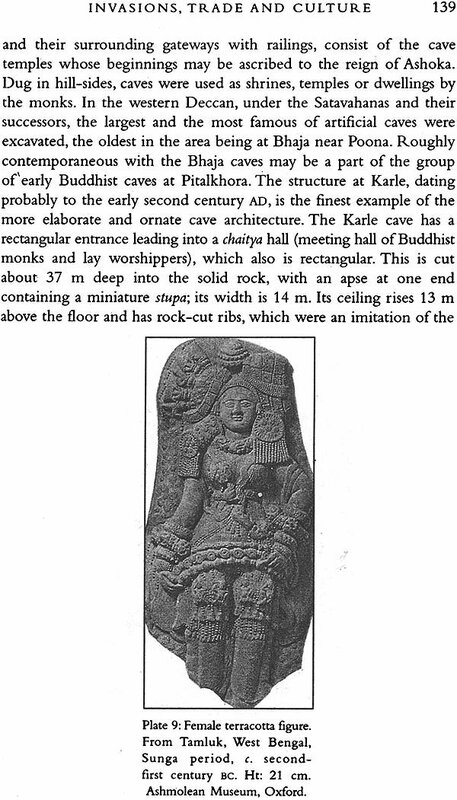 Inevitably they attempted to push back the antiquity of Indian culture. B.G. Tilak thus assigned the Vedic texts to the third millennium Be, while A.C. Das placed some of the. Rigvedic hymns in the geological ages. 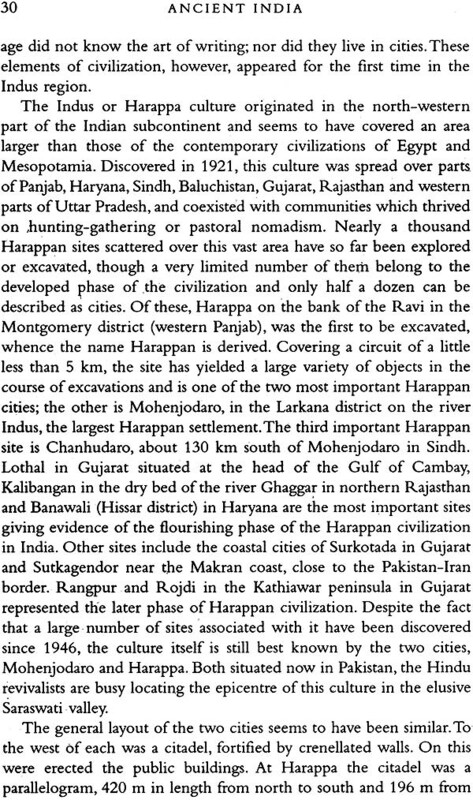 Though the discovery of the Harappan civilization in 1923-4. proved the falsity of their assertions, the fantastic antiquity given to the ancient Indian culture generally, and to the Vedas particularly, remains a favourite pastime of scholars even today. This does not apply to Rajendra Lal Mitra (1822-91), Ramakrishna Gopal Bhandarkar (1837-1925) and Vishwanath Kashinath Rajwade (1869- 1926) who generally adopted a rational attitude to the past. 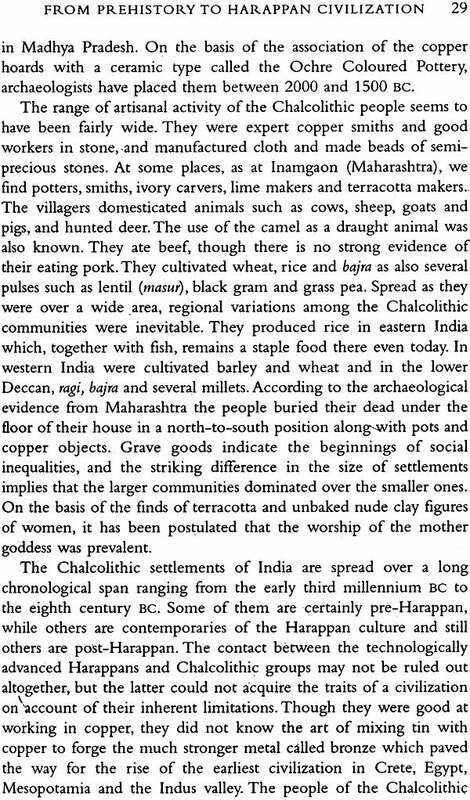 Mitra published a tract to show irrefutably that in ancient times beef-eating was not a taboo. Bhandarkar, being a social reformer, supported widow remarriage and castigated the evils of the caste system and child marriage on the basis of his study of the ancient Indian texts, and made significant contributions to the reconstruction of the political and religious history of early India. V.K. Rajwade's insightful study in Marathi of the evolution of the institution of marriage is a classic. He is also remembered for collecting a large number of Sanskrit manuscripts and sources of Maratha history, later published in twenty- two volumes. Initially inspired by the ideas of social reform, Indian historical scholarship gradually became overtly anti-imperialist . With the radicalization of Indian politics after the partition of Bengal in 1905 and the simultaneous growth of militant nationalism, Indian historical writings were conditioned and influenced by contemporary political developments which sharpened the edge of the freedom struggle. Pardy in reaction to the imperialist view of India's past and partly as a step towards the building up of national self-respect, Indian historians made zealous efforts to refurbish the image of India's past. Hindu culture was looked upon as the precursor of other Asian cultures; this buttressed the theory of pan-Hinduism. The ancient period of Indian history, equated with the Hindu period in James Mill's scheme of periodization, was regarded as one of prosperity and general contentment. 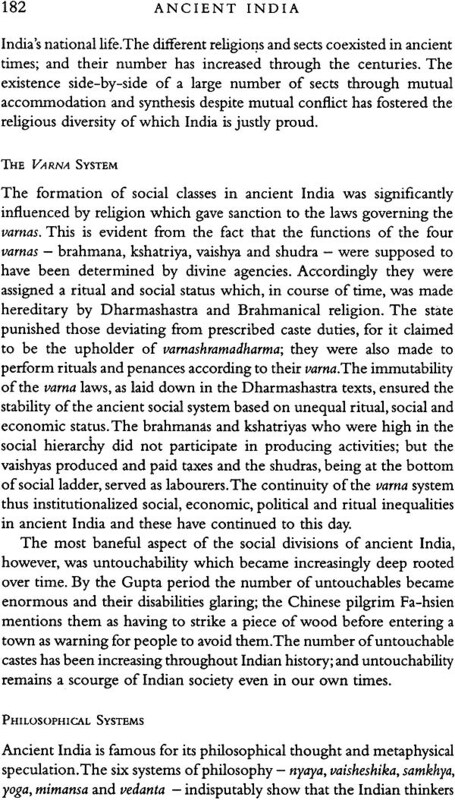 Social inequalities were glossed over and Indian society was portrayed as a model of social harmony and peace. The age of the Guptas came in for special praise. 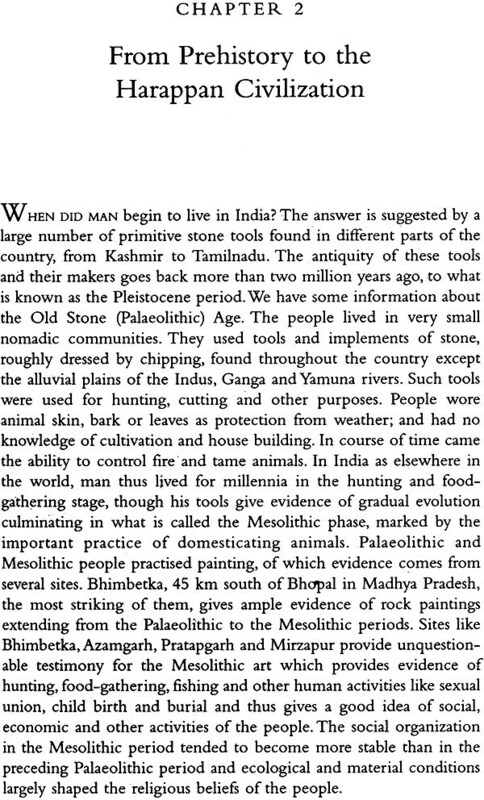 It was considered the golden age of Indian history-an idea which continues to find importance in most textbooks.